by Armstrong, Susan J., Botzler, Richard G.
Armstrong, Susan J., Botzler, Richard G.
INTRODUCTION "Unchopping a Tree," W.S. 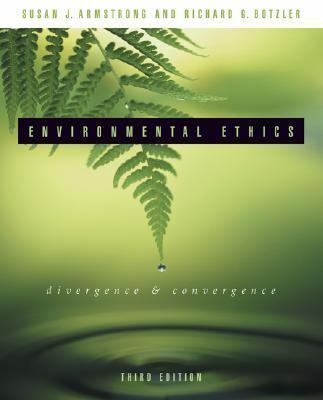 Merwin For Further Reading PART ONE: THE MULTI-DISCPLINARY CONTEXT OF ENVIRONMENTAL ETHICS CHAPTER ONE: SCIENCE "Conduct, Misconduct, and the Structure of Science," James Woodward and David Goodstein "Putting Science in its Place," Eric T. Freyfogle and Julianne L. Newton "Facing the Problem of Uncertainty," Ragner Fjelland "Feminism and the Study of Behavior," Marlene Zuk "The Little Things that Run the World," E.O. Wilson Discussion Topics Class Exercises For Further Reading CHAPTER TWO: MORALITY "A Short Introduction to Moral Philosophy," James Rachels "Some Basic Points about Arguments," James Rachels "Environmental Ethics: Values in and Duties to the Natural World," Holmes Rolston, III "Environmental Ethics and the Social Construction of Nature," Anna Peterson "Environmental Ethics as Environmental Etiquette," Jim Cheney and Anthony Weston "Just Garbage: Environmental Injustice," Peter S. Wenz Discussion Topics Class Exercises For Further Reading CHAPTER THREE: AESTHETICS "Walking," Henry David Thoreau "A Near View of the High Sierras," John Muir "A More-Than-Human World," David Abram "The Land Aesthetic," J. Baird Callicott "The Far Outside," Gary Nabhan Discussion Topics Class Exercises For Further Reading CHAPTER FOUR: HISTORICAL CONTEXT "The Ancient Roots of our Ecological Crisis," J. Donald Hughes "Anglo-American Land Use Attitudes," Eugene C. Hargrove "Whither Conservation Ethics?" J. Baird Callicott "Wasty Ways: Stories of American Settlement," Alan Taylor "Nature in Industrial Society," Neil Evernden "Rachel Carson's Environmental Ethics," Philip Cafaro Discussion Topics Class Exercises For Further Reading PART TWO: FUNDAMENTAL WORLD VIEWS CHAPTER FIVE: RELIGIOUS AND CULTURAL PERSPECTIVES "The Historical Roots of our Ecologic Crisis," Lynn White, Jr. "Created in the Image of God: Humanity and Divinity in an Age of Environmentalism," Lawrence Troster "Environmental Ethics: Some Challenges for Christians," Holmes Rolston, III "Islamic Environmental Ethics, Law and Society," Mawil Y. Izzi Deen (Samarrai) "Voices from White Earth," Winona LaDuke "The Sun my Heart," Thich Nhat Hanh "Ideologies of Environmentalism," Madhav Gadgil and Ramachandra Guha Discussion Topics Class Exercises For Further Reading CHAPTER SIX: ANTHROPOCENTRISM "Animals are Machines," Rene Descartes "Duties to Animals: The Failure of Kant's Moral Theory." J. Skidmore "Anthropocentrism: A Modern Version," W.H. Murdy "The Golden Rule: A Proper Scale for our Environmental Crisis," Stephen Jay Gould "The Invented Landscape," Frederick Turner Discussion Topics Class Exercises For Further Reading CHAPTER SEVEN: INDIVIDUALISM from The Case for Animal Rights, Tom Regan "Equality for Animals?" Peter Singer "Environmental Values," Peter Singer "Animal Liberation is an Environmental Ethic," Dale Jamieson from Respect for Nature: A Theory of Environmental Ethics, Paul Taylor "Biocentric Individualism," Gary Varner Discussion Topics Class Exercises For Further Reading CHAPTER EIGHT: ECOCENTRISM "The Land Ethic," Aldo Leopold "Whither Conservation Ethics?" J. Baird Callicott "Aldo Leopold's Concept of Ecosystem Health," J. Baird Callicott "The Land Ethic at the Turn of the Millennium," Holmes Rolston, III "The Deep, Long-Range Ecology Movement: 1960-2000--A Review," Bill Devall Discussion Topics Class Exercises For Further Reading CHAPTER NINE: ECOFEMINISM "Quilting Ecofeminism," Karen Warren "Ecofeminism," Vandana Shiva and Maria Mies from States of Grace, Charlene Spretnak from The Legacy of Luna, Julia ButterArmstrong, Susan J. is the author of 'Environmental Ethics Divergence and Convergence', published 2003 under ISBN 9780072838459 and ISBN 0072838450. Loading marketplace prices 12 copies from $31.88 How does the rental process work?